This post is specifically about your sock and/or underwear drawer(s). When it comes to socks and underwear, I used to think it was impossible to have “too many” socks or underwear. But there IS such a thing as too much! I have a policy. I have donated socks that are in good condition, but I tend to throw away underwear that has ever been worn. I think the only underwear I’ve ever donated were ones specifically purchased to donate. Ladies’ bras may be donate-able but I’d be careful about the condition. Would you wear a secondhand bra that was stretched out, stained, or with exposed underwire? There is nothing wrong with going through items like this – it gives you room in your dresser drawers! 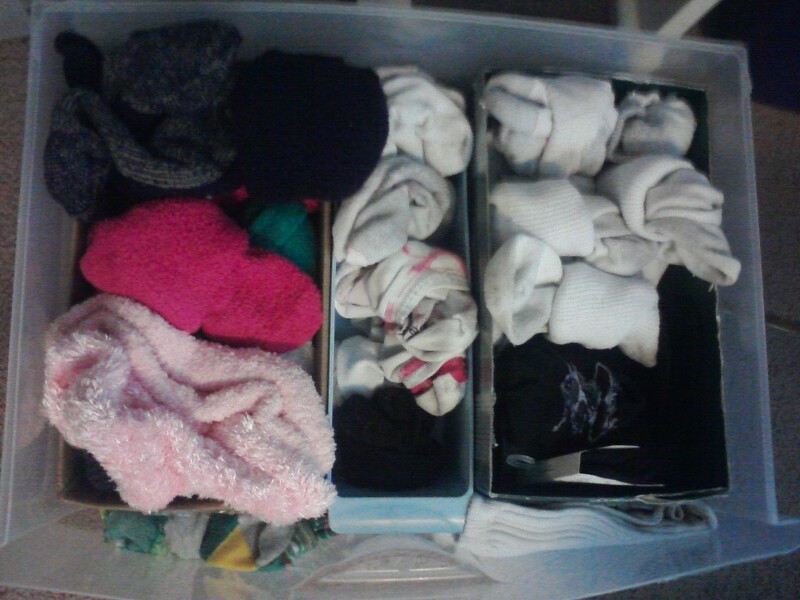 My sock drawer is huge… I roll all the socks into pairs and the drawer is then organized into boxes. Left: Fluffy winter socks that I tend to wear only at home when it gets real cold here in Missouri. In the middle: ankle socks. I don’t have as many of these because I like to wear sandals in the summer. Also, they are smaller socks. Right: crew socks for winter as well as dress socks for work toward the front. It’s always nice to keep your dresser drawers organized so you can find what you need! This entry was posted in Declutter, Organization, Uncategorized and tagged declutter, decluttering, drawers, dresser drawers, organization, organize, organizing, sock drawer, socks, underwear drawer. Bookmark the permalink.